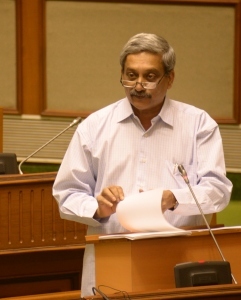 Garbage-free Goa, beggar-free Goa and kerosene-free Goa are the three major slogans chief minister Manohar Parrikar has pronounced while focussing on late-night passenger mobility in the tourist state and 4000 jobs every year in IT sector. Parrikar was back in action with his extensive budget, which he prepared in a record time of a week, after being in the saddle once again, giving up one of the highest position of defence minister of India. Making it populist with hardly any taxation measures, he presented a surplus budget of Rs 202.48 crore. The budget size is 9 per cent higher than last year – Rs 16,027 crore. He also said that at current prices, the growth rate would be 11 per cent while it was 10 per cent for the last two years. Parrikar also announced two year-long celebrations this year – one to mark 175 years of Panaji city and second 50 years of Opinion Poll, which was part of the Goa Forward manifesto. “Comprehensive mobility plan is another important area I plan to implement this year”, he told the media after presenting the budget. It includes starting intra-city hybrid and electrical buses from tourist spots to the towns even at late night and introducing river navigation, including amphibious buses that run on the road as well as in the water. For this, he also exempted VAT and motor vehicle tax on electric vehicles while spelling out his plan to introduce intra-city bus system on PPP model. Parrikar also rolled back on his 2012 most popular measure of NO VAT on petrol. It would be now 15%, along with diesel. “But it would be less than the neighbouring states and petrol would not cost more that Rs 65 a litre”, he assured the House. Rolling back on another controversial measure of the BJP regime, he has decided to scrap the Entry Tax once GST regime (Goods and Services Tax) begins. He has also lifted the moratorium on rent-a-bike as well as motorcycle taxis (pilot). Honest Goans should investigate that Did Congress purposely gave chance to BJP to form Government like GFP did? Because it said that Congress & BJP are husband & wife. Both know each other’s Secret and Congress ideology is Corruptions.